That’s my dilemma… I could get a wider variety of fabrics buying it by the yard, but the actual yardage would be considerable less… I like going to fabric stores when they put their fat quarters on-sale for $1 and then buying as many as I can afford. That always helps increase my fabric stash.. I would buy by the yard. I like lots of variety. I like lots of fabric! 🙂 Or buy lots of bolts to have lots of variety! Good luck in your weight loss journey. Many of us are travelling with you! Thanks for the ecouragement Candy!! I’m down 12lbs already feel tons better physically. The dieting isn’t the difficult part for me it’s spending my free time at the gym… I want to be putting quilts together instead! I vote for variety! Any left-overs could be used later for a patchwork project. Fun! Thanks for a VERY wonderful idea Shana!! 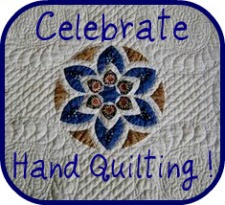 I like that and feel I know enough quilters that might actually make that work!